This is often a subject that evokes heated discussions. Sometimes objective, sometimes verging on the aggressive. People seem so easily caught up in the “us and them” mentality, whoever the us and them happens to be at any given time. I don’t want to do that though. I have strong opinions on this subject, but I’m certainly not here to tell other people what to do, and I’ll listen to anyone who can stay civil! Originally, the plan was always for me to attend a specialist boarding school for blind children. I really didn’t want to go. I liked living with my family and couldn’t think of any reason why I would want to go and live somewhere else with people that I didn’t know. Who would do that? However, Before the time I was due to be sent away, my family had a change of heart. Thanks partly to the new technology I received, I was able to attend the local primary school. I attended four schools in total and was the only totally blind child and Braille reader there. I can’t make a comparison as some people can who attended a mixture of specialist and mainstream schools. Mainstream school was all I knew. I had my specialist equipment – at first a Braille machine and the old BBC micro. Later I updated to a Braille notetaking device from which you could get printed or Braille copies of work, depending on whether you connected it to a normal printer or a Braille printing device. Later I moved to a laptop, and this is what I’ve continued with throughout my working life. My books and any worksheets that I needed were prepared by an assistant so that I had them in Braille. I also had huge Braille books for my lessons – the German pocket dictionary was 10 large A4 volumes! The books that I studied for English A levels were 7 or 8 volumes each. I had so much to carry – at one point I was banned from carrying books for more than one lesson at a time due to worries about manual handling and the strain on my back! Now I do a lot more electronically, but I still maintain that it’s important for children to learn to read in Braille. Nowadays, electronic Braille displays are much more common than they were when I was at school. At the beginning I had a learning assistant with me all the time. This lessened as I grew older and in the end I only had the support for maths, or practical subjects where I might be let loose with an electric saw or equipment for experiments in the science lab. During A-level lessons, I didn’t need any support. My favourite subjects were languages – in my case English, French and German. I preferred science and humanities to the arts. Maths drove me crazy, although I still got a decent grade, and PE and games were the worst. Not because I was lazy, but I thought some of the activities I was asked to join in with were pretty pointless. I became more interested when I was allowed to do things that made sense to me, like using the gym equipment or going swimming. Cross-country in the snow was just the worst, and I didn’t enjoy learning about games that I would not be able to play. I enjoyed school because I didn’t struggle academically. Games was a reminder of what I couldn’t do, which is why I was glad when I could go swimming instead. And of course I had my horse-riding outside of school! I’ve since learned that there are team sports for blind people, but I’m not sure I’d have been interested if I’d known about them before – too rough – too dangerous – I’d rather have had my head stuck in a book! I always had friends, but I preferred smaller groups of good friends to socialising with lots of people and being part of a big crowd. I was never bullied, but I was never that fussed about being popular either. Some people would like me – others wouldn’t. That’s kind of how I go through life now. I saw no point in changing myself to fit with whatever expectation was popular at the time, and my main point of being there was to learn. Having said that, I made some lovely friends and have good memories of the things we got up to. I was often resistant to socialising in the way people wanted me to – that shows in the school reports – but part of the deal there was that I just didn’t like being in the noisy lunch hall or outside. Apart from some differences, such as art, where I was allowed to work with clay rather than to draw things, I did pretty much the same as everyone else. I had friends who helped me, but I helped them too. I gravitated towards specific roles in group work, such as presenting or writing, rather than gathering the information from inaccessible books, but at the end of the day, someone needed to fulfil that role and often others were happy for me to stand up in front of the class because they didn’t want to. Teachers learned that my friends shouldn’t be used to compensate for their lack of preparation – I needed accessible materials and it wasn’t ok to ask people to read things to me that were still warm because they’d just been dashed off the photocopier! Supply teachers didn’t always get this, but I think on some occasions nobody had even told them that I’d be in their class! Of course not everything was easy at school. I had the same exam stress, friend troubles, achievements and disappointments as everyone else. I was strong-willed and determined, which got things done, but didn’t always make me popular! It said on my year 7 report that I didn’t suffer fools gladly, and that included adults who thought they knew best, but were suggesting things that had no chance of working. But somehow this set me up for life in a world where things aren’t always accessible and you do sometimes need to stand up for yourself to get the things that you need. As a younger child, I was always involved in the school productions. Acting wasn’t my thing, but I wasn’t scared of reading in front of a hall full of parents, and that type of job was always going to be available! For the last two years (12 and 13) I moved to a different school because my one didn’t have a sixth form. I wasn’t the only new girl, but a lot of the other people knew each other, and I was welcomed accepted there. Maybe there are a few things we could have done differently. I’m an “all or nothing” kind of girl – so I can’t be kind of interested in things. I either like them or I don’t. I think at some point I gave up with maths because I just didn’t get it, and maybe we should have stuck at it and found other explanations for me for the things I wasn’t getting. But hey, I did ok in the exam, and we can always come up with smart ideas when looking back! Overall my grades were above average and I got the highest grades in the things that really interested me. I guess I was different, but I never had a hard time because of it. I think I sometimes tried to take control of the difference – to be different because of something other than my blindness. Something of my choosing. So I was Kirsty, the one who loved languages. Kirsty, the horse-mad girl. Kirsty who got top marks in the exam. Kirsty – the Hermione Granger type who annoyed everyone by learning lists of dates off by heart, but who could get a class credit to benefit the whole class by reciting them. My hyper focus could be annoying, and a problem when others didn’t share my interests. However, on more than one occasion, the history class asked me to engage the teacher in an in-depth political discussion so that everyone else could chill out for half an hour! I was happy to oblige. Kirsty who had the cool tech! Ok there were the obligatory “can you make the speech software say rude words” questions, but in time some of my friends were learning Braille too, and if a teacher’s talking, you can get a lot more down when typing on a laptop than you can with a pen and paper. I wanted to own the narrative, and not just be different because I was unable to see. Obviously this was a big difference, but thanks to the good support I received and my friends, I didn’t feel at a disadvantage because of it. Knowing what I do now about additional needs, I wonder whether other things were missed as my differences were generally assumed to be visual impairment related. I don’t think they were entirely. But neither do I think that I missed out on any help that I needed – I either asked for the help, or said all the right things and then continued doing things my own way (“I will try harder to socialise more…”)! I think for me, the biggest advantage was that a mainstream school set me up to thrive in a world that isn’t only made up of blind people. It’s a world where the edges aren’t rounded off for you and you will come across inaccessibility, things that are twice as hard for you as they are for others, and things that you need to speak up about. Overall, I had a lot of really nice, kind, motivated teachers. However, none of the classroom teachers had worked with a blind person before and I had to work with them to establish how we would do things. I did lock horns with people in the education system at times, but it was never these classroom teachers who were doing their best to make their lessons accessible. When I was about to leave high school, one teacher admitted how she had been apprehensive about working with me and how I would learn in her class. But we did it together. We tried things out, and if they didn’t work, we tried something else. Teachers learned to dictate as they were writing on the board and describe what they were doing as they demonstrated things in the science lab. I’m aware that this was extra work. One teacher used my report as a place to point this out, which wasn’t the appropriate place for it, but in general, most teachers did the extra work willingly and in doing so, made their lessons more inclusive. I actually enjoyed working with people who had never taught a blind person before. They don’t think they know everything and are generally more willing to listen. Ok, they may not have the experience of blindness that teachers in a specialist school would have, but everyone is different, and one size doesn’t fit all. So as well as the teachers learning about inclusivity, my classmates also saw someone working alongside them. Maybe I didn’t do everything in the same way as them, but unless there was a really graphical element to what we were doing, I was expected to meet the same standards as they were. I just did it with a laptop and huge folders of Braille! They did absolutely help me – whether that was getting somewhere unfamiliar, reading inaccessible information, or doing visual parts of presentations. But I can also remember trades, such as me giving help with German in exchange for having my nails painted (I still can’t do it now!) or someone explaining what’s going on in the German video whilst I tried to translate and tell them what was being said. I think it’s really important for non-disabled children to learn alongside children with disabilities so that the idea will be nothing new when those same children grow up to be adults in charge of recruitment. We can’t expect to have inclusion and integration if it doesn’t start at school. I wouldn’t want to be segregated because of other characteristics. Most of the time I thought boys were annoying, apart from the quiet ones who wanted to learn stuff, but I wouldn’t have wanted to go to a school just for girls. In year 12, we had a Japanese exchange student join our class for a while. We became friends and she taught us about Japanese food, language and culture. I had had no experience of any of these things before, and as well as improving her English and learning about life in the cold UK, she taught us a lot too. Diversity is a good thing and we can all learn from different perspectives, or people who do things differently to us. I can’t write a lot about this because I didn’t go to one. I know some people who did. Some of them are not that different from me. Maybe it was easier for them because they never had to think about anything being accessible. Their teachers were all familiar with blindness-related things. But bullying can happen anywhere, and blind kids can be as mean as sighted ones. As I’ve listened to other people’s experiences, I understand that it’s not as nice and easy as we may think. On the plus side, these young people had more exposure to the blindness community and specific activities that had been organised for blind children. Fro mmy point of view though, I never missed this. Then there is another group of people that seem to have difficulty adjusting to life after specialist school. They didn’t make sighted friends as a child, because there weren’t any around. They don’t know how to respond to people who are different to them because they only knew the homogenous group where everyone else was blind. They can then find it harder to socialise or integrate into the sighted world, or to cope when things go wrong. This isn’t true for everyone of course, but I’ve seen enough examples of it to identify a pattern. Even though it may be uncomfortable at the time, I’d argue that it’s better for a child to learn how to self-advocate from a younger age, than to have all the obstacles taken away from them, and then fall at the first hurdle after school. Specialist school may be good at developing blindness and other independence skills, but I’m not convinced that it prepares people as adequately for what comes next as a well-supported mainstream school experience can. So, where does that leave us now? I think choice is important. If mainstream education would be detrimental to a child’s learning, then of course there should be alternative provision to help them reach their potential. This could either take the form of specialist provision elsewhere, or a unit, allowing for some classroom time and some work in smaller groups or one-to-one. If the local educational authority is not providing enough support, then I can understand why a parent would opt for an alternative. I was lucky. I got the hours of support and the equipment that I needed. It makes me sad to read how some children nowadays don’t. Ultimately though I believe we should strive to have a system that allows children with additional educational needs to learn in a mainstream classroom, both because of the skills they can develop there – skills that have nothing to do with academic learning – and because I believe an inclusive society starts in the classroom. What are your thoughts on this? Let me know in the comments! Ok so maybe talking about this Hashtag is just giving it more publicity, which is actually the opposite of what I want to do, but still I think it’s a conversation worth having. You know, that old saying that if you sit there and say nothing when something’s going on that you don’t agree with, it’s actually like agreeing with it because nobody knows that you didn’t! The first time I became aware of it was at the weekend and it was actually a tweet in which someone wasn’t supporting it, to which I agreed. I hadn’t heard of it before though. It’s basically a hashtag that people with disabilities are using to highlight some of the odd experiences they’ve had, where members of the public have been offensive, clueless, or said inappropriate things. They are real-life stories. Some just bizarre, but many show the ongoing barriers, misunderstandings, inappropriate comments or strange behaviour that many people face regularly. That’s not cool. These things shouldn’t happen. Discrimination is real and should be stopped. I’ve had my share too – and continue to do so – but still, I don’t like the hashtag. Why do I have a problem with it? If it were just about highlighting some of the bad, maddening, or otherwise crazy experiences, either to bring a bit of humour or raise awareness, I think that’s fine. I’ve had comments that made me angry, sad, or roll my eyes in the past – I’m not exempt from them. How something affects you often depends on the kind of day you’re having. Great day – you think “what an odd thing to say” and move on. Terrible day –then sometimes it all feels too much. But in the same way that I wouldn’t want someone to call me a “disabled” or “a blind”, I have an issue with the term “ableds”. Isn’t this reinforcing the stereotypes that everyone in a massive group of the population is the same? Isn’t that something that disabled people complain about? Also, I don’t live in a sub-community that consists of only people with disabilities. Most of my best friends are non-disabled, and I hate the thought of “us and them”. It widens the gap between us. It’s about blame. Ultimately, if someone behaves badly, or fails to be inclusive, then yes it is down to them. But it’s way too general for my liking to start calling everyone in that demographic weird. And for the love of all that is good – the first time I was in a group of mainly visually impaired people, I thought a lot of them were pretty weird as well! I attended a short IT course after my A-levels at a centre that catered specifically for people with visual impairments. The way I was hit on there and the bizarre questions I was asked were far worse than anything that happened while I was at mainstream school. So let’s not get too smug in the weirdness comparison stakes! There are times when only someone who has had a shared experience will know exactly how something feels. You could argue that only someone who has worked with an assistance animal for a number of years can really know how hard it is when your dog isn’t there any more – not just because you were friends, but you were a team too. People who don’t have to deal with accessibility issues every day can empathise, but it’s probably really only people who live that struggle who know just how much it can piss you off. Yet, having said that, there are many times when I relate more to the “them” than to the “us”, precisely because I don’t live in a world where most people share my experience and disability. I’m more than just my visual impairment. I share other life experiences, interests, challenges and accomplishments with my partner and friends that have absolutely nothing to do with my inability to see. It would be the same for me with any other type of hashtag that makes a statement about a huge group of People. Something about “men are” or “people over 50 are” or “people with children are” – it’s just not cool. I don’t belong to that demographic, but neither do I have the right to lump them all together and insult them! Especially not if the whole point is to try and get better treatment for a minority group to which I belong. I strongly believe that as human beings, we have more that unites us than sets us apart. I believe we need to work together more. To share experiences, including problems, and try to find solutions. I’m not saying that because I have an unrealistically optimistic view of the world and underestimate the problems. I spent a large chunk of today researching something that would have taken a sighted person far less time because they could have used any of the information, whereas I had to sift through twice as much as I needed in order to find accessible resources. I wish people would design more accessible websites and not think we all learn from inaccessible videos and diagrams. But I can’t fix that by just insulting those people! There is a way to share experiences in an objective and not accusatory way that still gets a message across. One day I’ll write a post about all the crazy things people have said to or about my guide dog. I can also think of some inappropriate things that people have said, things that I don’t necessarily want to give a place on the blog. There’s a way of calling out that behaviour too, and I certainly don’t think we should avoid those uncomfortable discussions. But I’d be a hypocrite if I used a hashtag that I myself thought was offensive – which is why I won’t be promoting it. Many people with disabilities have joined in – and that’s their choice. Many more are blissfully unaware of the hashtag as I was, or maybe some are afraid of the backlash for swimming against the tide of popular opinion. Who knows. The comments I’ve seen have talked about non-disabled people getting offended by the hashtag, but I’m willing to guess that like me, some disabled people are offended by it too! Do you want to be able to see? I have a genetic eye condition. There’s a lot of research going on at the moment into it, in terms of possible treatments. I follow this research with interest. I like to be informed, but more than that, if the opportunity became available to get involved with the research, I’d be interested to know more. One thing that makes me a less likely candidate for any possible treatment is the fact that I’ve never been able to see before, so my brain would need to learn to interpret any visual stimuli it received, either through gene therapy or implanted technology. That would definitely be more hard work than someone would have to do if they had been able to see before. They would be able to relate what they were seeing to what they had been able to see in the past. Still, I don’t know that It would be all bad to start from scratch. Yes, you’d have to learn about things like colours and depth perception like a small child, rather than drawing on your memories, but on the other hand, any sight would be a bonus. You wouldn’t keep saying “this isn’t as good as what I used to be able to see”. I sometimes wonder what it would be like to see loved ones for the first time, or to look through my possessions and ask myself “did you really wear that colour lipstick?! I don’t know what colours I like because I’ve never seen them. How would I rate the advice about my physical appearance that I’d been given over the years? Would I make changes to my home décor? Would I discover a favourite colour I never knew I liked? What would I find aesthetically pleasing? How good would my visual special awareness be. Of course a lot of this would depend on the treatment and level of vision it afforded, but they are interesting questions nonetheless! There would definitely be a learning curve involved, but I think of the many practical ways in which life would be easier. Getting around without using a cane, reading things without making sure they were accessible, finding things that were dropped or mislaid, using any website, irrespective of whether it had been designed accessibly. However hard I work to lead a full and independent life, there are still times when I need to ask for help with things that others can just do without thinking about it. Yes, we all need help at times, but having a disability often involves a lot more planning to make sure you know exactly where you’re going, where something is, or how to put in place alternative strategies for doing things when the standard ways don’t work. The first time I got really frustrated about being visually impaired was when I was about 9 and couldn’t go and bring the horses in from the big field to be ridden. Yes, there are things I could have done to make this task doable as a blind person. Plenty of blind people ride and have their own horses. But it suddenly struck me as a practical example of a task which was easier for my friends and would require more planning on my part. So I found something else to do and went home and cried about it where nobody could see! This isn’t supposed to be a negative post, but I want it to be an honest one. Sometimes stuff is hard, and I don’t subscribe to this “nothing is a problem unless it’s a problem other people create for me” mentality. So in a practical sense, being able to see would make life easier. I continued riding throughout my teenage years and we found other ways of doing things as you can read in my riding post. But sometimes it would be nice just to get on with things without all the additional thought and adaptations. I also touched on this in my I’m tired post. Then there are the nice-to-haves. Not being able to see a beautiful view, wild animals, or the sunset isn’t going to change the practicalities of your everyday life, but there are some things that even the best descriptions don’t do justice to if you’ve never seen them before! Many people name not being able to drive as being a major set-back for people who can’t see. I don’t really see it that way. Sure, life is easier now that I have a partner who drives, but I lived for many years in London, where many of my friends didn’t drive, and driving wasn’t essential. It’s a bit different once you leave the capital, but still I wouldn’t say not being able to do it is high on my inconvenience list. It’s maybe no bad thing that I can’t drive given my low stupid behaviour tolerance threshold. I probably wouldn’t be the most calm and forgiving person on the road! But getting around new places without having to memorise everything would be nice, as would exploring the countryside or visiting new places without having to think about route planning and sat nav. And before anyone comes up with the objection that some blind people do that – I know they do, but I find it stressful! Things are rarely fun and stressful at the same time! When I was a baby, my family were basically told that there was nothing that could be done about my eye condition, so they should just go home, not think about a cure, and get on with teaching me to gain the skills I’d need. In some ways I can see the value of focussing on the here and now, rather than hoping for something in the future that may never come, but it’s still good to be curious. It’s still good to find out what’s happening in medical research and see whether any of it is relevant. I agree it’s not helpful for parents of newly-diagnosed children to focus only on what might happen, when they could instead have a very real influence on what will happen. It’s important to teach children how to find other ways to do things that don’t rely on sight, and to focus on all the things that they can do and enjoy, rather than the few things that they can’t. Blind children need to know that there’s a big world out there, which can be explored with or without sight. Technology has opened up so many doors for us. Using my assistive technology, I can do things independently that I would have needed help with if I’d been born 50 years ago. That’s amazing! You definitely shouldn’t be defined by something that you’re physically unable to do. But we live in a visual world. If your child wants to experience that for themselves, and the option becomes available – well they should have that option too in my opinion. Do all blind people feel as I do about sight restoration? Of course not! It’s a massive group of individuals and I’d be surprised if you could find anything that all blind people agree about! However, I ask the question because often people generally assume that blind people do want to see, and it even surprised me that this could start such heated discussions. I had wrongly assumed that most people see the question in the same way as I do, but not everyone does, and that’s ok. It’s their right. Some people feel there’s nothing missing from their lives as they are now. I don’t really understand this, but it’s definitely something that should be respected. Perhaps I see it differently because I’ve never really accepted blindness as part of my identity. It’s something that determines how I do certain things. It’s something that I’m often asked about. It’s something that has led me to focus on and develop my other senses more. But it’s not intrinsically part of who I am. I wouldn’t miss it if it wasn’t there tomorrow. Other people view this differently, and that may explain why they wouldn’t want to give something up that they see as part of their identity. There can also be differences between the opinions of those who have never been able to see and those whose vision has deteriorated. I’ve even had people say to me “you can’t miss what you never had”. This is true in the sense that I didn’t actually lose something that I had before, but if you live in a world where everyone around you has something that you don’t, and many services, leisure activities, and ways of accessing information are geared to having that sense – then even if you have never had it, there’s still a way in which you can miss not having access to it. Not everyone feels that way though, and from my observations, there seem to be a higher number of people that have never seen who say they are not interested in seeing or anything to do with being able to see. They know no different and are content with that. Another comment that often comes up in these discussions is that people don’t want to be “fixed” as though other people see them as broken if they aren’t able to see. I do understand this to some extent – it’s tedious if people focus on what you can’t do, even though in some areas you may have accomplished more than the person feeling sorry for you has. Though I’m sure it’s not their intention, if all someone can do when they meet you is talk about the things that you can’t do, it can devalue all the other things that you have achieved. That doesn’t feel good. People should be accepted as people, and not seen as broken machines that need to be fixed. I can accept that. However, I see people working in medical research as allies, not as those who want to fix me. Having said that, I am far less positive about random strangers who come up to me and try to start praying for me to be fixed. This is not ok! In terms of the medical treatment and broken or fixed debate, there is part of my body that doesn’t work as it should, and if given the choice, I’d like to have something done about that, so long as I understand what’s involved and the risk of no dangerous side effects is not too high. Writing this post is not to say I’m dissatisfied. I have a wonderful partner, some amazing friends, a lovely home, a job that interests and challenges me, and plenty of things that give me enjoyment and fulfilment in my spare time. But there are days when I’m not ashamed to say that being blind is hard work or there are things that I would really like to experience visually. That’s why I follow the research and keep an open mind. Life is good, but I’m not going to close my mind to something that could make it even better! I don’t expect everyone to agree with me, but I do expect everyone to be civilised in the comments! Author englishwithkirstyPosted on March 12, 2019 Categories stories, UncategorizedTags blindness, disability, sight restoration, visual impairment2 Comments on Do you want to be able to see? This idea has been on my “posts to write” spreadsheet for a while, and with all the talk of the Birdbox challenge, it reminded me that I wanted to share my thoughts about the whole “dining in the dark” experience. Don’t get me wrong – if people want to turn all the lights off and eat their dinner in the dark, it’s totally up to them! But I do have some concerns about things that I’ve read or heard about these experiences, particularly when it’s seen as a representation of what life is like when you are really unable to see. This is the first problem. Many people with sight loss are able to see something. Even I can see lights, although this doesn’t help me to eat my dinner because I can’t se colours and shapes. But blindness doesn’t mean 100% sight loss for everyone who is affected by it. If someone is suddenly plunged into darkness, all they have is their other senses, but none of those skills and tips that I’ve picked up over years of eating without the ability to see. You just have to get on with it, without knowing how to measure how much is on your fork by how heavy the fork is, or by using your knife and fork together to measure the size of the piece of food. It’s true there are times when I put an empty fork to my mouth, and that is irritating, but it’s better than trying to ram something in there that is way too big! You haven’t learned how to pour things without looking, or without spilling anything. You haven’t learned to be aware of where things are on the table, so as not to knock them over. I am not perfect, and everyone drops or spills things occasionally, but I’m no worse than most of my sighted friends, and less clumsy than some of them. These things matter to me – I don’t want to be seen as clumsy, so I make sure that I’m not. You haven’t learn to use your fork as a tool to work out what foods are based on their shape or texture. You haven’t learned to use your fork to run it under the edge of the knife to see whether it’s serrated, and therefore whether your knife is the right way up. Ok, this caught me out the other day because I wasn’t paying attention, but blunt knives don’t cut well and there is a way to check, without involving fingers. You haven’t learned to be aware where the edge of your plate is, so as not to push food off the edge. These are all things that (most) blind people learn at an early age. But good luck, you have 2 hours to master them, and you might not have anyone around to give you tips! I know some dining in the dark experiences let you order what you want, but apparently others just present you with a plate of stuff from vague choices like “meat” and “vegetarian”, and you have no idea what’s on it. This has occasionally happened to me at buffets in the past – something that can’t happen now because I need to be clear that there’s nothing on the plate that will set off my allergies. I don’t like people drawing attention to my blindness by describing where everything is on my plate – I can work this out for myself – but it’s not unreasonable to want to know what’s on there. Not least because there might be something horrible, like peas, that need to be removed or avoided! I wouldn’t feel comfortable about being presented with a plate of stuff with no idea what’s on it. This idea just seems to make the whole experience more uncomfortable, and when would that even happen? Is it assumed that blind people don’t prepare their own food or know what they’re ordering in restaurants? Going out for dinner is fun! For me at least it is. S and I went out for a meal yesterday and saw it as a nice thing to do. We meet up with friends. We go out for dinner if we want to celebrate something special, or on occasions when neither of us feels like cooking. It’s not an ordeal for me, and neither does it look like feeding time at the zoo when we’re done. Whilst some people may have feelings of trepidation before a meal in the dark, it doesn’t mean that eating out is a negative experience for people who do it all the time. I cringed at the idea of “Oh well, noone else can see, so let’s just ignore the cutlery and eat like the monkeys”. There are some foods that it’s acceptable to eat with fingers. But you can’t just abandon normal civilised table manners just because you can’t see and nobody can see you. Ok, if someone loses their sight, they need time to learn. And some people naturally have better coordination skills than others, but for people to automatically make the assumption that everyone eats like this is not ok. It’s actually quite insulting. Not being able to see is no excuse for having food all down your dress! People who do this all the time tend to have a better idea of where their mouth is! How do you think my first date with S would have gone if I’d eaten like that? It involved whole chicken breasts (no skin or bones) and pasta, and was very good, but do you think there would have been a second date if I’d carried on like that? Blind people, unless they live in a bubble, are generally not only surrounded by other blind people. People can see us and form opinions about on us based on how we behave and present ourselves. Ok, I do make life easier for myself by not ordering things like spaghetti when out – because spaghetti should be snapped into more reasonably-sized lengths before it even sees the saucepan. I also don’t tend to order things that have to be dissected because you can’t eat all of it – chicken breast that has to be relieved of its skin is a pain. But generally, I order what I want and deal with it. If the food is served in a dish for sharing, I usually let friends serve me – because it’s easier, they can judge the portions better, and any spillage on the table cloth is then clearly down to them! But I’m also capable of doing it myself. So you can’t use proper cutlery or wine glasses? In one review that I read, it said that the knives were blunt and people drank their wine out of tumblers – because sharp knives and real wine glasses were asking for trouble! Why didn’t they just go the whole hog and have plastic ones? No, plastic cutlery is actually really annoying! I can see why they did it – you don’t want people who have suddenly lost their sense of spatial awareness suddenly brandishing a steak knife around, but it’s still unrealistic. If I have a steak, I want a good sharp knife to chop it up with. And if you give me wine in a tumbler, I’ll be insulted – unless it’s in a restaurant where everyone has them because it’s supposed to be trendy! It’s an idea that any restaurant can take on board, so there is no way of measuring how well it is being done. I’ve heard of some blind people who work in these restaurants and they’ve reported that it’s a really good way to get into conversations with people. But with no standards or guidelines, what is being done well in a little town somewhere in Germany, may not be replicated somewhere else. When someone said that to me, all I could think to say was “no, you really don’t!” You know what it’s like for you, as someone who’s spent years doing things in a certain way, suddenly being asked to do them in a different way, with no help or experience to rely on. Oh, and whilst you can step out of the darkened room after the meal is over, I can’t. I have written this from the perspective of someone who has never been to a “dining in the dark experience”. My comments are based on what people have told me, and first-hand reviews that people have written online. Whilst I don’t usually review things I haven’t experienced myself, what interests me here is the impressions that people come away with who have never done this before, and the way the experience is being portrayed online. If you had a different experience, feel free to share it. Many of these restaurants provide employment for people with visual impairments, which in itself is a good thing. I’ve heard first-hand that visually impaired people get into conversations with the diners about what life is really like when you’re blind, which is also a good thing – probably. If the whole experience were just about the role that being able to appreciate food visually plays in the eating experience, I could probably go along with that. We do enjoy food with our other senses. I did hear from one person who saw it as a kind of challenge to learn to do things in a different way, and I could respect that. But so many other people left their sense of self-respect along with their coat and phone in the bar, and I find that really odd. If people just have a good time and enjoy the experience for what it is – fair enough. I want people to have fun! Maybe they’ll learn some things about themselves too and be happy about it! But whenever I read reviews, all I find is people saying how they felt vulnerable, gave up on the cutlery, had no idea what they were eating, shovelled food in with their hands, whish they’d worn a bib, and then reckon they have a better understanding of what life is like for me? I don’t think so! How about you? Do you have any thoughts on this? Have you been to one of these experiences? Let me know your thoughts in the comments. So, I nearly didn’t write this post because I certainly don’t think I’m an expert on the subject. The presents that I wrap aren’t the worst I’ve ever seen, but they aren’t works of art either. My plan is get the job done, and I don’t usually have time for lots of faffing about! Still, I read a post about someone with a visual impairment having a tough time wrapping presents, so I thought I’d share the tips that I’ve picked up along the way. Some of them are just good advice anyway, but some are specifically for you if you’re wrapping gifts with little or no sight. Make life easier for yourself by either buying gifts that are easy to wrap, or putting them into square boxes that are easy to wrap! When buying wrapping paper, try to get some that’s slightly textured, so you don’t end up with the picture side on the inside. I have done this before! Grr! When cutting wrapping paper, if you struggle to cut straight, fold the paper first and cut along the fold. Really flimsy paper is not good for this, so if you can, it pays to get slightly better quality so that it doesn’t tear. When folding, fold at a right-angle to an edge that you know is straight, such as the side of the roll. Think about your tags – you need to be able to identify the packages in a way that you can read, but if they won’t be opened straight away, so do other people. Don’t be tempted to use a piece of paper that’s too big, rather than cutting it down to size. There’s more chance of it creasing up and looking untidy. My sticking tape is never perfectly straight along the line, but if you want to stop it creasing or being really wonky, hold it over where you want to stick it first and then lower it into position. Don’t be tempted to work with really long strips of tape unless you’re sure that you can get them straight and that the paper won’t move. It’s often easier to tack the paper in place with a couple of small bits before you try to tape down a long crease. Long-bladed scissors work better for cutting paper. If you have two edges and one looks tidier than the other, put the untidy one inside so people won’t see it. Bows and sparkly things are as good for covering mistakes as they are for making things pretty! If you really don’t enjoy wrapping, there are always present bags and boxes that you can buy, fill with tissue paper, and put your present inside. Some shops also offer gift-wrapping services. Throughout Blogmas I’ll be unboxing my two advent calendars from Glossybox and the Body Shop and giving a brief product review. Body Shop – before we had a shine liquid lip colour, and today it’s time for a matte liquid lip. I find matte liquid lipsticks a bit drying, so this isn’t one I would have picked up, but it’s more moisturising than some I’ve tried, so I was actually quite happy to have it! There are a range of shades, but I got Tahiti Hibiscus. Glossybox – it’s a day for lip products! Today we got a full-size lip gloss from Steve Laurent. And it smells and tastes of chocolate mmmm! Today you have another chance to enter my Unseen Beauty Blogmas giveaway. There will be a box with 10 prizes from the Glossybox and Body Shop advent calendars, and the prizes will be revealed throughout December. You can enter once on each Blogmas 2018 page, which means you have up to 24 chances of winning. You can enter at any time from when the page goes live to the end of December 2018. Multiple entries on the same page will not be counted – I have a spreadsheet to log them! Your answers to the questions will help me to get to know my readers and where they are based. Also, they prove that you’re a real person as I don’t use inaccessible widgets on my site. The giveaway is international, but if postal restrictions prevent me from sending a product to your country, I will replace it with an alternative. The form only goes to me. Huda Beauty Winter solstice palate Featuring one pearlescent creamy formula and three icy pressed pearl powders. Spa of the World® French grapeseed body scrub from the Body Shop. An eye make-up brush from the Body Shop something will be coming later to go with that! MUA Cosmic Vixen palette with 15 eye shadows. Products 9 and 10 coming soon! The give-away is open until 23:59 on 31st December 2018, and I’ll draw the winner on 2nd January 2019. I will give each entry a number and then draw the winner by asking Siri to generate a random number. I want to make it as easy and accessible as possible for people to enter. Your email address is being collected solely for the purpose of contacting you if you win the prize. You are welcome to sign up to my newsletter at the same time, but this isn’t necessary to take part in the give-away. If you do not win the prize, your email address will only be stored if you have signed up to the newsletter or asked for your entry to be carried over to the next give-away. I will email the winner on 2nd January to ask for their address so that I can send the prize. The winner will have 7 days in which to respond. If they haven’t responded after 7 days, I will draw a new winner. My thoughts on Purple Tuesday -what is it and why does it matter? This isn’t the post I was planning to write today, but I didn’t know about Purple Tuesday, or that it was set up to highlight the needs of, and problems faced by disabled shoppers. I found out about Purple Tuesday through this video on Lucy Edwards’ YouTube channel – go check her out if you haven’t already! better training for retail staff so they don’t try to turn away guide dogs. The reason I feel passionately about all of these things is that they’ve all happened to me. It’s not a good experience when you have money to spend, or you’ve found something that you like, and then you can’t buy it, or you can’t buy it independently, because your needs as a customer aren’t met. I don’t take it personally, and I don’t think it’s intentional, but nobody likes to feel that as a customer, they are seen as less valuable or less important. I actually prefer shopping online. It’s one thing to go out for a day out with my friends, and actually S is a really good shopper too when it comes to finding what I’m after, but if we’re talking about me shopping on my own, then online is the way to go! I choose to give my money to sites that make the shopping experience easy for me. Their buttons are labelled. They don’t make you rely on a mouse. They don’t have sloppy code that means my screenreader reads a load of numbers instead of what will happen if I click a particular link. If I’m lucky, the make-up items will be described, using normal colour words, and not fancy names that give you no idea what colour something is. That’s not always how it works though. I can remember times when I’ve had to abandon an order of flowers for someone’s birthday because of an inaccessible date picker to select what day they should be delivered. The order couldn’t be checked out without this. So I had to abandon the order and go elsewhere. I can think of a time when I filled my shopping basket, but then couldn’t check it out, because you could only click the button with a mouse. By the time I got some sighted assistance, the session had timed out and the basket was empty again. I went elsewhere. I can think of a missed promotion because I had to wait and ask a sighted person about the colour of something. By the time I had done this, the product I wanted had sold out. Each time it’s like having the door shut in your face, whilst other customers are being let in. And let’s face it, who likes to feel like that? I don’t tend to shop on my own in stores, because I have to rely entirely on shop assistants to help me find the products I want. This isn’t really my idea of fun, but it should be an option for people who don’t want to shop online, or who don’t have people whom they can go shopping with. One of the biggest issues I had in shops was the amount of times people tried to deny access to me because at that time I had a guide dog. This is not ok. I usually pursued the matter, ended up speaking to a manager, and being told I could stay, but I shouldn’t have to go through this experience and it really dampens the retail therapy buzz! I’m writing from the perspective of someone who is blind, because this is what I know. But disabled shoppers have different needs, and one size doesn’t fit all. There are visible disabilities and hidden disabilities. Even two people with the same disability might not have the same accessibility requirements. I know how frustrating it is for wheelchair users who can’t access shops because there are steps, the isles are too narrow, or the things they want to look at are way above head height. Shops may not know themselves what they are getting wrong, which is why accessibility audits are important, taking feedback into consideration ,and working to address barriers that have been identified and are currently keeping potential customers out. This shouldn’t just be about one day . I would like to see a commitment to improving both online and in-store accessibility to disabled customers – not as an afterthought, but as something that happens as a matter of course. Is there anything that you can do to help make this happen? You can read more about Purple Tuesday in this article from the Guardian. Author englishwithkirstyPosted on November 13, 2018 November 13, 2018 Categories accessibility, Uncategorized, Website reviewsTags accessibility, disability, Purple Tuesday5 Comments on My thoughts on Purple Tuesday -what is it and why does it matter? I didn’t go for long bike rides as a child. We went walking with the dog, and my Granddad drove us for miles around the UK in the Summer Holidays, but I only discovered cycling as an adult. I would say the easiest and safest way for people like me, who have no sight, to cycle, is to do tandem cycling. My first introduction to it was on an activity weekend. Half of the time was to be spent canoeing and the other half cycling. As it turned out, I preferred being out of the water, but having tried both, I definitely prefer canoeing to kayaking because I don’t like being closed in, and if the thing tips, it’s easier to get out of a canoe than a kayak! Anyway – back to the cycling. As a child, I didn’t have balance issues, but I didn’t have enough confidence in where I was going to pick up enough speed to stay balanced. Having someone else in charge of the direction took this problem away, but there is still an element of trust involved. I don’t just mean you’re trusting the front rider not to stop peddling and let the blind person do all the work! I mean you need to communicate about what the other person is going to do – if they are going to turn, slow down or need to stop suddenly. You need to react quickly to what the other person is telling you. The faster you go, the more you need to trust them! It was also my first time covering longer distances, so I was fighting with the fear that I’d do something stupid and everyone would think I was an idiot, but fortunately that didn’t happen either! After a couple of hours I was fine! After the introduction weekend, I went on a week-long cycling holiday in Dorset with a mixture of blind and sighted cyclists. I was paired with a sighted cyclist at the beginning of the week, and it was great that we got on, because we spent the rest of the week together on the same bike. The evenings were for socialising, but the point of the trip was mainly to get in as much cycling as possible. The weather was mostly kind to us, but I got to experience cycling in heavy rain showers as well! The blind person always goes at the back, because they are not in charge of steering. My front rider gave me information about what was coming up, where the hills were,, whether there were any sharp bends, intersections, or loose dogs! But we had time to chat as well and enjoy the countryside. You have to find a rhythm and work together – if you fight for control, you will just annoy each other and topple over! That didn’t happen to us! Generally I let the other person set the speed, especially where other traffic was around, but made sure I pulled my weight as well, especially on the uphill stretches. I knew nothing about bike repairs or looking after the bike. The guy with me was more experienced, and explained things, but I felt an equal share of the responsibility for helping out if there was a problem. That week I shared a room with a Paralympic cyclist. I was a complete beginner, and I enjoyed listening to her stories as someone who had got really good, and really fast! We didn’t do anything like that during the holiday, but it was great to see how this is a sport that is not only a fun thing to do, but also something at which blind people can become successful. After the holiday my front rider and I stayed in touch for a while. I stood in for another blind rider who was unable to make the yearly cycling around churches in Kent – I believe to raise money for them. The idea of visiting a bunch of churches wouldn’t usually have interested me, but the bike ride did! I’ve cycled with a few different people, and the most relaxing experiences were with people who were relatively confident and who didn’t lose their nerve and swerve around all over the place, though I have experienced that too! It makes life interesting! You don’t experience the same sounds and smells if you’re in a train or a car. It’s different when you’re outside and responsible for getting where you want to be with your own energy! I enjoy walking too, but obviously you can cover more ground on a bike. Or a horse! I’m not sure how the experience is different for the person on the front of the tandem. Again there is that element of trust, so you need to believe that the person behind you won’t do anything erratic. Your bike is twice as long and twice as heavy as normal, because of the extra seat and extra weight behind you. You need to be able to look ahead and communicate. I have heard of one student who cycled to school on a tandem with an exchange student for a while, which I think was cool. The tandem was used in just the same way as other students would use a bike. For me, tandem cycling has been more of a fun thing to do, rather than a means of getting from A to B. You always need to have someone who needs or wants to go to the same place at the same time, and in most situations such as going to work, that isn’t the case. Still, I know that some blind people get their own tandems – which is fine as long as they have someone, or some people, with whom they can cycle regularly. Now all the cycling I do is just the exercise bike in my fitness room, but if I had the opportunity again to get on a tandem, I’d definitely take it. A blind person may not be able to see everything around them on a bike ride, but it’s a good way to keep fit, and it’s good to be outside and enjoy nature. 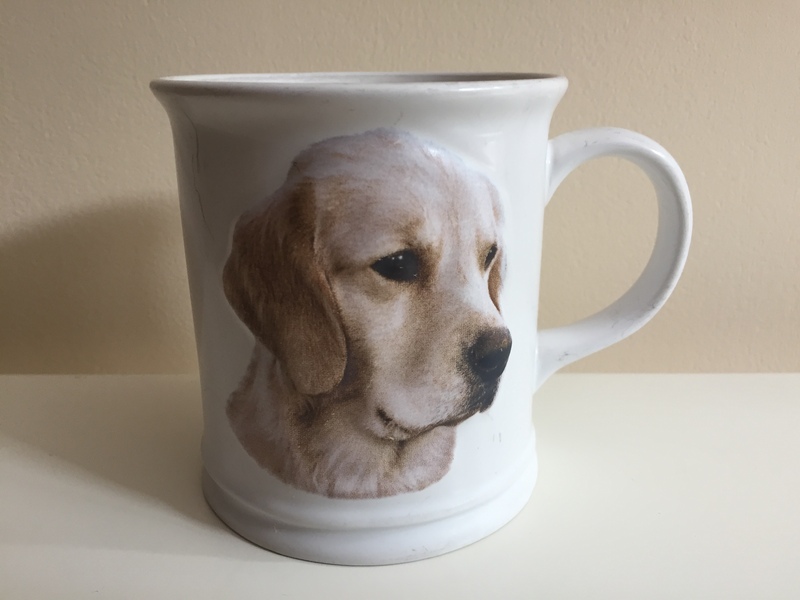 The day that my golden retriever Cindy died was a really tough day for me. I didn’t want to have to tell people about it and have the same conversation over and over again, so I posted it on Facebook. Just to get it done. However, as the day went on, I was really touched by all the kind people who left comments and kind words, or things that they remembered about her. I wasn’t particularly looking for interaction when I wrote the post – I just wanted to get the conversation out of the way. But I was glad that I did it. My blog isn’t the kind where I really open up online. Some people do, and I don’t want to judge them. If it helps to write all the emotions down and get it out there, and even better to get support from others, then why not? That’s cool. But if I’m having a bad day, generally the last thing I want to do is tell other people about it! I think a lot of this has to do with me as a person, and nothing to do with having a disability. If anything, I don’t share because in the past I’ve been the person that other people go to when they’re not ok, and then I got myself the reputation as the one who gets things done, finds solutions, and sorts out problems. Somehow people expect me to be positive, coping, and to have my sh1t together all of the time. Like some kind of superwoman – which, by the way, I’m not! Things have got better since I’ve been with my partner. I do open up more now, but not usually on my blog or social media. I think live and let live – if people want to reveal so much of themselves it’s their choice, but I can’t relate to what motivates people to do it. So I don’t. There’s a problem though. Not sharing means other people don’t know when things aren’t ok, or why. Sometimes it’s not as clear-cut as just one thing that’s gone wrong. Generally people can understand a specific thing. I had a bad day because something went wrong at work/I have a headache/my car broke down or whatever. The thing is – sometimes I get really tired. Not the kind of tired after you’ve been reading a good book till 3AM and still have to get up for work, but weary of having to do twice as much work as other people just to get a job done. It’s not all of the time. Many things that I do at work are just as easy for me as anyone else. Learning when I was 5 means that now, I can type faster than a lot of sighted people, which is great when you need to make detailed notes or get an accurate record of meetings. Thanks to my screenreader, I can read, write, work with spreadsheets, find information, and manage pretty much all areas of my business myself. Working in two languages isn’t more difficult for me than for anyone else. I’m organised, so my systems work well, and working for myself has eliminated a lot of inaccessible practices that I had to work through in other jobs. Sometimes people seem amazed at some of the things that I get done as a blind woman, whereas for me, they’re just normal things that aren’t particularly difficult. They would be hard for someone who suddenly lost their sight, but I’ve got strategies to get them done, so it’s not a big deal and I can do them on autopilot. But then there are the other things that leave me feeling exhausted. And it’s not just one thing. It’s the knowledge that often I have to work twice as hard to do something that would be really simple for someone else. That is frustrating at times. When I lived in London, it wasn’t so much my job that drained every bit of energy from me, as the trek across London each day (3 hours in total). Yes, I enjoyed reading my book on the train and chatting to the friends I made on the commute, but it was the careless tourists, the terrible drivers, the people who nearly trampled on my dog, the roadworks that appeared in a different place every day, the lack of audio announcements on the trains, the people with pushchairs who thought that everyone else was a second-class citizen and should get out of the way – preferably into the road, the cyclists who thought the red lights didn’t apply to them, and the religious or drunk people who thought that the woman with a guide dog was a captive audience. They stole my energy. One on its own would have been fine, but it all adds up, like putting more and more in your shopping bag until it’s so heavy you think it might split and you are sooo glad to get home and lock the door behind you! Does that make me a less capable or less independent blind traveller, or just a more honest one? It was hard. Some days were fine and I didn’t experience any of this. Others weren’t. If you’ve already had a tough day at work, things like that can wear you out! When I ask my partner for help on my laptop – sometimes it’s to draw on his vast IT knowledge, but more often than not, it’s to do the simplest task that I can’t do because some unhelpful person or organisation has designed their site in a way that I can’t use it independently. So it takes longer. I’m not going to get into the discussion about whether it’s a result of blindness or society not being accessible – because I think on a day-to-day basis, it’s often a mixture of both. The fact that I can’t find my keys because I wasn’t organised and didn’t put them in their place is my fault – not the society around me. And the fact that it takes me longer than someone who can easily see where they are is definitely related to the fact that I can’t see them. The fact that if I want to go somewhere new on my own, I need to do more planning than someone who could just show up and follow a map is just something I need to factor in, as is the fact that we sometimes need to do a bit more work beforehand to make a group activity with friends accessible to me as well. It’s not a reason not to do these things, but doing it takes time and sometimes energy. The fact that, in order to take part in a course, I have to write several emails, make phone calls and chase around till I get an answer about accessible materials is definitely a case of the organisation in question not making it easy for me. I can’t just sign up an go. On another self-study course that I started recently, I got part-way through module one before hitting the roadblock of a question called “label this diagram”. The content was easy. The diagram made it impossible for me to complete the task. So the options were find an alternative course, have a lengthy discussion about accessibility, or give up! I am not a fan of giving up, but I have learned now to choose my battles wisely, and focus on the things that will really add value. So, sometimes nobody is at fault. Also, finding someone to blame doesn’t make the extra work go away. On some days, all this extra work builds up. If I’m tired anyway – because life happened that way, it can make me feel exhausted. Most of the time I just take it in my stride, but each of these things saps a little bit of energy, and when you add them all together, it accumulates. I don’t want to whine about it. I don’t want others to feel sorry for me. I don’t necessarily need people to come up with solutions because chances are I already have one. The other problem is that people are often not that good at listening. They’d rather tell you about how something similar happened to their neighbour’s best friend’s spaniel, or about the vaguely-related article they read, whilst I sit there trying not to get bored and disengage because I don’t see the relevance to the thing we’re actually discussing. People want to contribute something, or at least not to admit they have no idea what to say – I get that. But listening is such an undervalued skill nowadays! So I often don’t share, because having to listen to lots of words with people trying to fix problems that I’ve already fixed is also kind of tiring. I just want people to understand that because I’m not openly losing it on Facebook or crying in a corner somewhere, it doesn’t mean everything is easy or fine. I get on with things. I’m not an emotionally needy friend. I’m maybe a difficult friend to have because my first thought isn’t to share when things aren’t going well. But sometimes I’m not looking for comfort – just for someone not to try and get me to carry their shopping bags as well whilst I’m struggling to carry my own (I mean the shopping bag analogy from earlier in the article). It doesn’t last long. A good night’s sleep, a good distraction – and the next day I’m ready to face the world again with new energy. But on a particularly tough day a couple of weeks ago, I did ask the question as to why we never talk about this. When I was younger, I would never have admitted it. “I can cope! I can do anything!” I still believe that I can cope and do anything I want to, but just because you can do something, doesn’t mean that there is no cost involved – whether that’s material cost or cost in terms of effort. Sometimes it’s the same amount of effort as anyone else would need. Often it’s more. There is no better time to have a disability such as blindness. Technology makes so many things possible. There are aps on my phone to read things, tell the colour of things, and help me to shop online without ever having to navigate a shop on my own! My laptop gives me access to find information or communicate with friends and customers across the world. I have a supportive partner, family and friends. But sometimes, just because I can make things look easy, it doesn’t mean that they are. I’m not really sure where I’m going with this – other than to say I think we should have the freedom to be real. I think people with disabilities often put ourselves under pressure because others believe that we can’t do things, or are amazed when we can do things that aren’t that hard. So we don’t want to admit any sign of weakness, because it somehow reinforces the stereotypes or a “can’t-do attitude”. Sometimes we get tired of people who always see the problems and never the solutions – and the worst thing would be to be seen as the same as them. And yes, I don’t have much patience with people who are unwilling to try because everything’s sooo hard! But going back to the original point – admitting you find something hard and doing it anyway isn’t weakness. Doesn’t that mean you’re a stronger person than the person who pretends the hassles aren’t there? I am still positive, determined, driven, and passionate about finding ways to get things done. But sometimes I get tired because of all the extra work that goes in behind the scenes – work that most people aren’t even aware that I’m doing – and today I decided admitting that this extra work wears me out sometimes is perfectly ok.
Why I recently switched from Tesco to Ocado for my grocery shopping. Sometimes my international customers are surprised that I do my grocery shopping online. It’s not as popular in Germany as it is here. I’ve been doing all my grocery shopping online for years now – since shortly after I moved to London. So that’s at least 15 years. It made me so happy, because previous trips to the supermarket had been a challenge. In theory you can ask for assistance if you are blind and can’t locate the products yourself. In practice, you are sometimes given any member of staff who can be spared, and that doesn’t always work out well. I had one really helpful lady, but the next week I got a young guy who thought that you find cheese in the freezer section, and when I thought things couldn’t get any worse, the next week I got someone who couldn’t read. This was appalling – both because I ended up without most of the things that I wanted, but as an employer, the supermarket set that guy up to fail, giving him a task to do that he had no fair chance of completing. He felt bad because he wanted to help, but couldn’t. I felt bad because I couldn’t point out the things that I wanted. It was a disaster. So, I tried online shopping and it was amazing. At first Tesco had a separate access site for screenreader users, and this was later removed, but the main site was perfectly accessible. I used it for years. Around 15 years. But then things started to go downhill. I found the site was getting slower, and a recent revamp meant that it became considerably less accessible. I’m not sure how the appearance of the site changed, although in an IT group for access technology users, one member said his sighted wife didn’t like the new site much either. The thing that a lot of people don’t understand with accessibility is that it’s not how the page looks, but the way it’s been designed, and whether a good user experience for access technology users has been built into the page at the design and coding stage. For example, using style headings for product names means that a screenreader user can quickly jump from one product to the next by pressing just one button, without having to read all the associated information if they don’t want to buy that product. A screenreader user can’t skim read and scroll, so having a good navigation structure on web pages is essential if you want screenreader users to be able to move around efficiently. Anyway – the headings for product names were done away with and the information was presented in a list, which was harder to navigate quickly. In addition to the slowness, sometimes the site crashed completely or threw up script errors. I tried different browsers, because sometimes this helps. But no. I just got more and more frustrated. Shopping took longer! My patience was at an end and I began to put off a job that I’d been doing easily for years. I did pass on my comments, but never heard anything back. One day was particularly frustrating and I ended up asking S to help me just to get the job done. But something had to change! Some of our friends had been talking about how happy they were with Ocado, so I decided to give it a go. I signed up for an account and hoped that the experience would be better. The first task was to import my favourites from Tesco. I believe a 3rd party site is used for this. It wasn’t great, because the buttons for the various supermarkets weren’t labelled properly, but I knew it couldn’t import anything without me logging in to the other site, so I clicked the first one and hoped for the best. It was Tesco! The cynical part of me wonders whether this is where most of Ocado’s customers import their favourites from! Who knows? This shows the importance of labelling your graphics – there are some people who can’t see the graphics and need to know what will happen when you click that button. Anyway – the favourites will only be imported if there is a comparable product in the Ocado database, so I inevitably lost some. However, it wasn’t difficult to search for things that were missing, and I ended up getting a bit carried away with new things that I wanted to try as well! It was easy to navigate around the pages, and Ocado does style their product names as headings, so I can quickly move through pages such as my favourites or a page of search results to find what I’m looking for. Booking my slot and paying for the goods was easy as well, and when the shopping arrived, everything was as it should be. I was also happy with the receipt. Tesco only provides an email confirmation of the order, but this doesn’t give any information about what actually arrived (for example if something was out of stock). The Ocado receipt tells you what was delivered, and also gives you information about when the products should be used up. This is particularly useful if you can’t see the packaging to check. To be honest I’ve never given myself food poisoning with out-of-date food, and now S is around to check, but in the past I’ve often frozen things to be on the safe side. With this information on the receipt, I don’t need to. In terms of Unseen Beauty, I have been impressed at the extensive skincare and beauty section, so there will be some new reviews coming soon. At the moment I am enjoying free access to the smart pass, which gives you free deliveries as long as you hit the £40 minimum spend. I will probably renew this when the free trial runs out because we will save in the long-term on delivery charges. I couldn’t imagine doing my grocery shopping any other way now – as someone who is blind, there are so many advantages. I can read about the products. I can choose exactly what I want. I can browse for new things when I feel in need of some inspiration. I don’t have to wait for a taxi to get myself and all my shopping home. I don’t have to ask for help in-store. I can do the shopping any time that suits me, even if that’s the middle of the night. If there are cooking instructions for something, they can usually be found on the website. In addition to all these advantages, it’s still important to have a website that works, that’s efficient, that provides a good user experience, and that doesn’t drive me crazy every time I want to do our weekly shop! Ocado ticks all of these boxes and I wish I had made the switch sooner. Much is said in marketing about loyal customers, but even someone who has been using a company for 15 years will leave if they feel that the quality of service is not what it once was, or that there is a better deal elsewhere. In addition to the plus points I have already listed about Ocado, there are other benefits such as the price match. If your shopping is found to be cheaper at Tesco, as mine was last week, you get a voucher for the difference. You can then redeem this voucher when you do your next shop. You also get 5p back for every carrier bag that you return, and there is a good range of products for people with dietary requirements, such as gluten or dairy free diets. When you’re checking out, you have the option of healthier choices for things that are in your basket. Ok you may want an unhealthy treat, but if you’re looking for a healthier diet, it’s nice to have the suggestions. If you would like me to send you an invitation to Ocado, just fill out your details using the form below. You will receive a £20 voucher for your first shop, and a free smart pass, which gives you free deliveries for one year (minimum spend applies). If you request an invitation, your email address will be entered on the Ocado site to generate an invitation. It will not be stored by English with Kirsty. If you request the news updates, your email address will be added to my mailing list so that you can receiveUnseen Beauty news, usually twice a week. I will receive a reward if anyone signs up through me, but I only promote things that I believe are good value and am using myself. Whether it’s holidays, business travel, or tagging along when my partner goes on business travel, (one of the advantages of having an online business that can be run from anywhere), I’ve stayed in a number of hotels and had good and not so good experiences as a visually impaired guest. I thought I’d share some of them with you today. Overall, I found staff to be friendly and helpful, and if travelling on my own, someone accompanied me to my room to show me where it was and answer any questions. This also included pointing out important things like the bar and restaurant. Negotiating breakfast buffets can be challenging, so I usually ask for assistance with this and have never had any problems. Some of the most helpful people I’ve met have been cleaning staff. People who have gone out of their way to be helpful, to show me where something is, or on one occasion to come out in the rain and give me directions because the receptionist couldn’t be bothered. On that occasion we didn’t share a common language, but I was very grateful to that lady. I don’t have a guide dog now. When I did, and travelled for business, I generally didn’t have too many problems, although most of our travel was booked by an agency and for once I was not directly involved in educating people about access rights for guide dogs. Generally people were happy for me to find a good place for my dog to empty! One security guard even came out with us when it was late. There was one occasion when I was travelling with a group of colleagues and the receptionist couldn’t tell me what room I was in because of “security reasons”. It didn’t seem to matter to her that I couldn’t see the key card she’d handed me. Rules are rules you know! Her solution was for me to ask my colleague. Fortunately he was a friend as well, but what if I hadn’t wanted him to know what room I was in? Wasn’t this a far greater security issue than just taking me aside and telling me the room number? It had been a long day and I didn’t pursue it, but I thought it was poor customer service. I don’t have any particular requirements when it comes to the room itself. The first things I do are to check out where the plug sockets are, as I usually spend some time working in the room, and figure out how to get onto the wifi. Most of the time, I don’t have any trouble joining the wifi, but we had one issue because although the logon screen for mobile devices was fine, I couldn’t join the wifi with my laptop because the log on button could only be activated with a mouse. This meant that if my connection dropped, I needed to wait for my partner to come back and click the button for me because my visual impairment means that I don’t use a mouse. Fortunately I could just set up a mobile hotspot, but it was an expense that other guests didn’t have, and it could have been avoided because if this page had been designed better, I would have been able to access the button via the keyboard. The picture I chose for the header image of this post is Hans the horse – or that’s what we named him! He was in a quirky hotel in Sweden and looked down over the desk, watching over me while I worked. I don’t expect to be able to appreciate the art in hotel rooms, but I was really happy to discover this 3d horse head because it was so tactile and unusual. There was also a big, metal heart on the wall, which again was 3d and tactile. I’ve decided that I would love a horse head like that in my office! I don’t worry about things like the tv because as long as I can get on the internet, I have all my media on my phone – whether that’s podcasts, audio books, news, music, or Netflix. So I never bother trying to figure out how the TV works. Other things like kettles, showers etc are pretty simple to work out. The air con can be an issue for me. In older rooms, you just turn a knob one way to make it hotter and the other way to make it colder. Sometimes there is just an up and a down button. But when you have to remember a more complex set of button combinations, or when the air con is controlled by touch screen, it gets difficult for me, especially if there is no window to open and regulate the temperature that way. In such cases I’d rather be too cold and put on layers than too hot, but it would be great if such things could be controlled by an accessible app. I’ve only recently started using the Seeing AI app from Microsoft that can do text recognition. I use it a lot for my products that I test for this site and would say it gets about 70% of them right in terms of reading the text. I know that some people have successfully used this app for identifying toiletries in hotel rooms, but I haven’t tried it out yet. Usually I bring my own, but if S points out that something contains mango or smells amazing, I am happy to give it a go. When travelling alone though I always took my own. One small issue is that staff servicing the room sometimes try to be helpful, and even if the room doesn’t look amazingly tidy, many blind people have a system or remember where they put things. It’s not helpful if you have to spend half an hour combing the room for something that has been tidied up. I generally put everything away – either in drawers, in my case, or in my laptop bag, so there is nothing to tidy up! Sometimes I’m working in the room anyway, so I just ask for new towels, the bin to be emptied, but not the full room service. Then I stay in control of my space! This doesn’t mean I never spend time hunting for my keys, but I can’t just look around the room for them, and if someone puts them in a place I would never put them, it won’t occur to me to check there. The only time this became a real issue was when my dog bowls were thrown out when the room was cleaned. I’d just been to a funeral and was in no mood to hunt down missing dog bowls, but I needed something to put my dog’s food in! The hotel apologised and provided industrial-sized plastic ice-cream containers for me to use, and I hope they passed on the point as staff training in terms of not throwing away things that belong to guests. At the other end of the scale I had a member of staff running down the corridor after me because I’d left jewellery behind after checking out! On the whole I’ve found people to be considerate and helpful, without being patronising, which is great! When I travel with S, he usually does some familiarisation with me when we get to a new hotel. I don’t tend to roam around using all the facilities on my own because in the daytime I have work to do, and I’d rather do it somewhere where I won’t be disturbed. I learn important things though like how to get to reception, and where the emergency escape route is. I thank my time working for a Health and Safety Advisor for that, but I have been in evacuation situations before and it’s important to know the way out, especially if you can’t see the exit instructions. I can read the raised numbers that you get in lifts, and sometimes I even find Braille on lift buttons or hotel doors, although this happens more often in other parts of Europe. Otherwise I have to remember a series of turns and count the doors to make sure I get back to the right room – because who wants to have a lost blind woman trying to break into their room at night?! Sometimes people try to be helpful and offer us ground floor rooms, or rooms near to the lift. Being near a lift isn’t a good thing because it often interferes with the wifi reception and I’d rather have a longer walk if I get better wifi! There’s no reason why I can’t climb steps, and if there’s a big function on at the venue, being away from all the action is actually nicer. Everyone’s different and while some disability awareness training can be helpful, I think that emphasising the point that everyone is an individual and will have their own way of doing things is more important than giving staff a set list of things to do when meeting people with specific needs.